BLEND is a CCP4 program for analysis of multiple data sets. 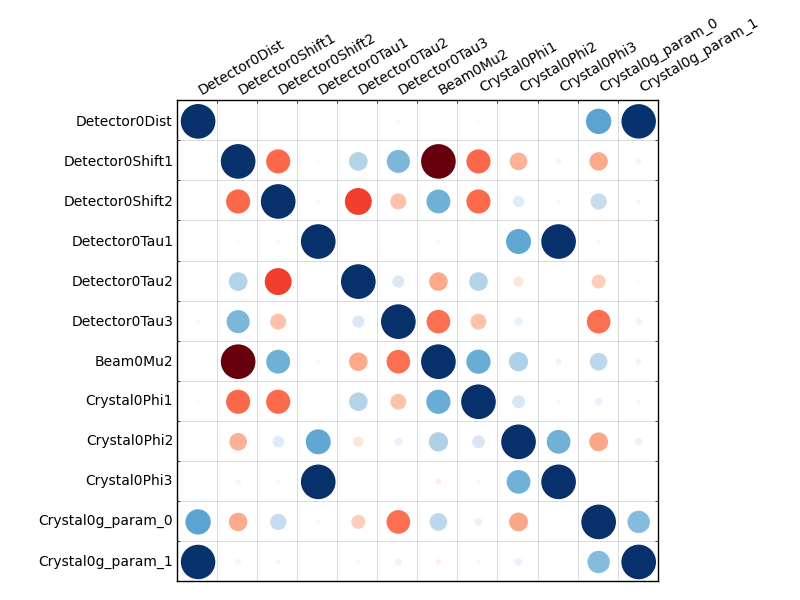 It attempts to identify isomorphous clusters that may be scaled and merged together to form a more complete multi-crystal dataset. Clustering in blend is based on the refined cell parameters from integration, so it is important that these are determined accurately. Unfortunately, for narrow wedges of data (where BLEND is most useful) cell refinement may be complicated by issues such as the high correlation between e.g. the detector distance and the cell volume. One solution is to fix detector parameters during cell refinement so that the detector is the same for every dataset processed. However, this is only feasible if an accurate detector model is determined ahead of time, which might require the use of a well-diffracting sacrificial crystal. If we only have the narrow wedges of data available then it is more complicated to determine what the best detector model would be to fix. If we can make the assumption that the beam and detector did not move during and between all of the datasets we collected then we can use DIALS joint refinement to refine all of the crystal cells at the same time, simultaneously with shared detector and beam models. In this tutorial, we will attempt to do that for 73 sweeps of data collected from crystals of TehA, a well-diffracting integral membrane protein measured using in situ diffraction from crystallisation plates at room temperature. Each sweep provides between 4 and 10 degrees of data. This tutorial is relatively advanced in that it requires high level scripting of the DIALS command line programs, however candidate scripts are provided and the tutorial will hopefully be easy enough to follow. That was a smooth start, but now things get abruptly more difficult. Before we perform the joint analysis, we want to do the individual analysis to compare to. This will also give us intermediate files so that we don’t have to start from scratch when setting up the joint refinement job. Essentially we just want to run a sequence of DIALS commands to process each recorded sweep. However we can’t (currently) split the datablock into individual sweeps with a single command. We will have to start again with dials.import for each sweep individually - but we really don’t want to run this manually 73 times. The solution is to write a script that will take the datablock.json as input, extract the filename templates, and run the same processing commands for each dataset. This script could be written in BASH, tcsh, perl, ruby - whatever you feel most comfortable with. However here we will use Python, or more specifically dials.python because we will take advantage of features in the cctbx to make it easy to write scripts that take advantage of parallel execution. Also we would like to read datablock.json with the DIALS API rather than extracting the sweep templates using something like grep. second is the filename template of the images to process"""
cmd = "dials.index P1_experiments.json strong.pickle space_group='H 3'"
# WARNING! Fast and dirty integration. # Do not use the result for scaling/merging! # uncomment the following line if short on time! print "Successfully created the following MTZs:"
are the lines that are executed when the script starts. First we check that the script has been passed a path to a datablock. We then extract the 73 sweeps from this into a list, then get the filename templates from each element in the list. We associate each of these templates with a number to form a list of ‘tasks’ to pass into process_sweep, but instead of doing this in serial we can use easy_mp to run in parallel. This will be okay because inside process_sweep, we ensure that all results are written into a new directory. First we use a facility of the easy_mp module to determine the number of processes to run in parallel and then we submit the job with parallel_map. Within process_sweep all external commands are run within a with block where execution is controlled by the context manager cd. If you want the gory details, they are here. Essentially this is a way to write clean code that tidies up after itself properly. In this case, we will create a new directory, execute commands in that directory, then change back to the old directory afterwards. If the directory already exists, this will fail with an error. When dials.index is passed an experiments.json containing a crystal model rather than just a databock.json then it automatically uses a known_orientation indexer, which avoids doing the basis vector search again. It uses the basis of the refined P 1 cell and just assigns indices under the assumption of H 3 symmetry. The symmetry constraints are then enforced during the refinement steps carried out by dials.index. This procedure gives us a greater success rate of indexing in H 3, and required no manual intervention. Outlier rejection was switched on in an attempt to avoid any zingers or other errant spots from affecting our refined cells. Without analysing the data closer it is not clear whether there are any particularly bad outliers here. We could repeat the whole analysis with this switched off if we want to investigate more closely, or look through all the dials.refine.log files to see results of the outlier rejection step. We elected use all reflections rather than taking a random subset because these are narrow wedges and there are few reflections anyway. Taking a random subset is only a time-saving procedure, and it won’t provide much benefit here anyway. We don’t bother with the time-consuming step of scan-varying refinement, because it is the scan-static cell that will be written into the MTZ header. Scan- varying refinement would give us better models for integration but as we will only be running blend in ‘analysis’ mode we are in the unusual situation of not actually caring what the intensities are. In this case, the MTZ file is just a carrier for the globally refined unit cell! The profile.fitting=False option ensures we only do summation integration, no profile fitting, while the prediction.dmin=8.0 and prediction.dmax=8.1 options only integrate data between 8.0 and 8.1 Angstroms. As a result very few reflections will be integrated. The MTZ file here is just being used as a carrier of the cell information into blend. By restricting the resolution range this way we are making it obvious that the content of the file is useless for any other purpose. Do not use the data produced by this script for scaling and merging. More careful processing should be done first! After each of these major steps we check whether the last command ran successfully by checking for the existence of an expected output file. If the file does not exist we make no effort to rescue the dataset, we just return early from the process_sweep function, freeing up a process so that parallel_map can start up the next. 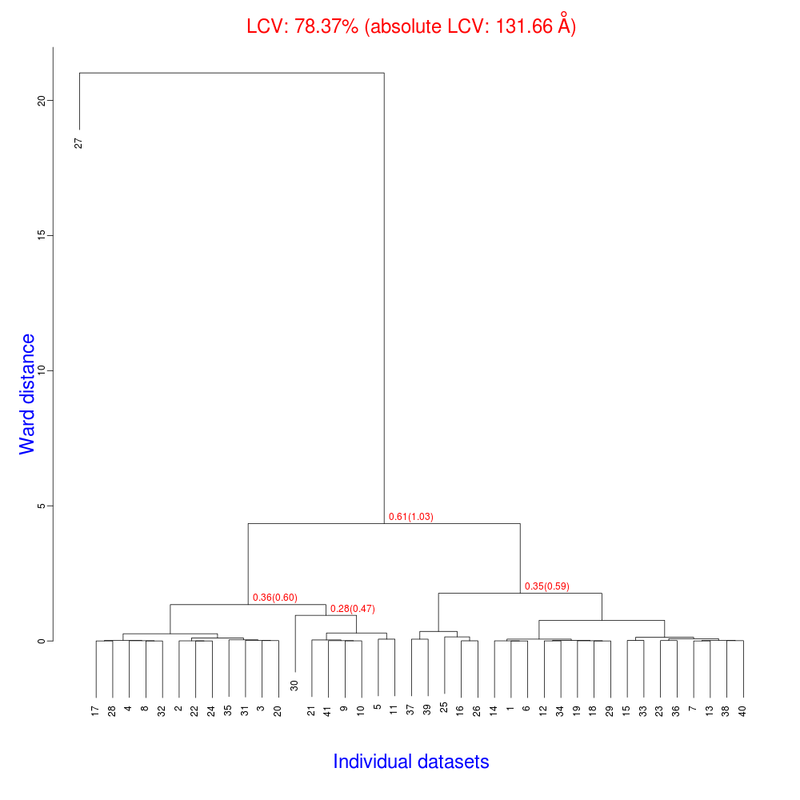 Immediately the dendrogram shows that dataset 27 is an extreme outlier. From FINAL_list_of_files.dat we can see that this refers to sweep_46/integrated.mtz. As we kept all the dials .log files from DIALS processing we could investigate this further, however as this is only one sweep out of 41, we decide just to throw it away and move on. So, edit individual_mtzs.dat to remove the line sweep_46/integrated.mtz and rerun blend. 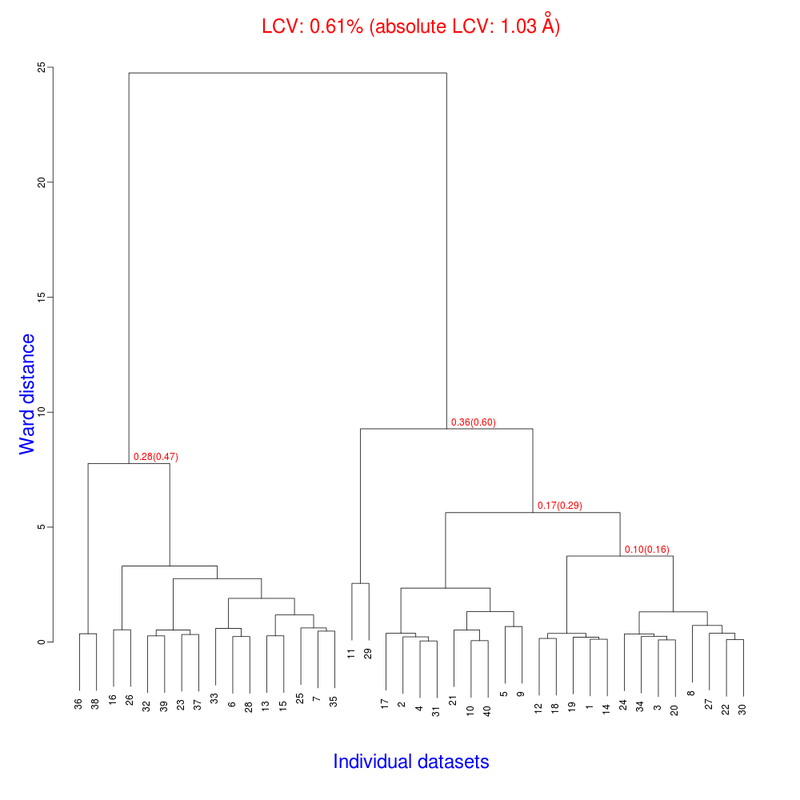 The Linear Cell Variation (LCV) is now less than 1%, with an absolute value of 1.03 Angstroms, indicating good isomorphism amongst all the remaining datasets. The new file sweep_00/corrplot.png shows correlations between parameters refined with this single 8 degree dataset. Clearly parameters like the detector distance and the crystal metrical matrix parameters are highly correlated. Useful though this is, it is clear how this could become unwieldy as the number of experiments increases. Work on better interfaces to multi-crystal (or generally, multi-experiment) data is ongoing within the DIALS project. Suggestions are always welcome! Oops! That wasn’t good. Looking at the error we see that experiment 19 provides only 8 reflections to refinement, which is disallowed by a default parameters of dials.refine, namely minimum_number_of_reflections=20. But from the output of dials.combine_experiments we see that experiment 19 has 243 indexed reflections. What happened? Well, forcing the individual experiments to share the beam and detector models of experiment 0 has led to some very poor predictions for some of these experiments. See the Summary statistics table, where the worst positional residuals are greater than 20 mm! We may put this down to the very narrow wedges of data we have. Experiment 19 is one of the narrowest, with only 4 degrees of data. Outlier rejection is not a good idea here because it selectively removes reflections from the worst fitting experiments. The overall final RMSDs are 0.17 mm in X, 0.16 mm in Y and 0.12 degrees in \(\phi\). The RMSDs per experiment are also shown, but only for the first 20 experiments. Rerunning with verbosity=2 does give the full table, but also produces a great deal more log output, so it would be easier to find in the file dials.refine.log rather than scrolling up pages in your terminal. Now we have RMSDs in X down to 0.1 mm, in Y to 0.06 mm and 0.06 degrees in \(\phi\). The RMSDs for experiment 0 are not so much worse than from the individual refinement job. We are happy with this result and move on to re-integrating the data to create MTZs for BLEND. second is the path to the directory containing the data"""
cmd = "dials.export %s integrated.pickle mtz.hklout=integrated.mtz"
The tree.png resulting from this is very interesting. 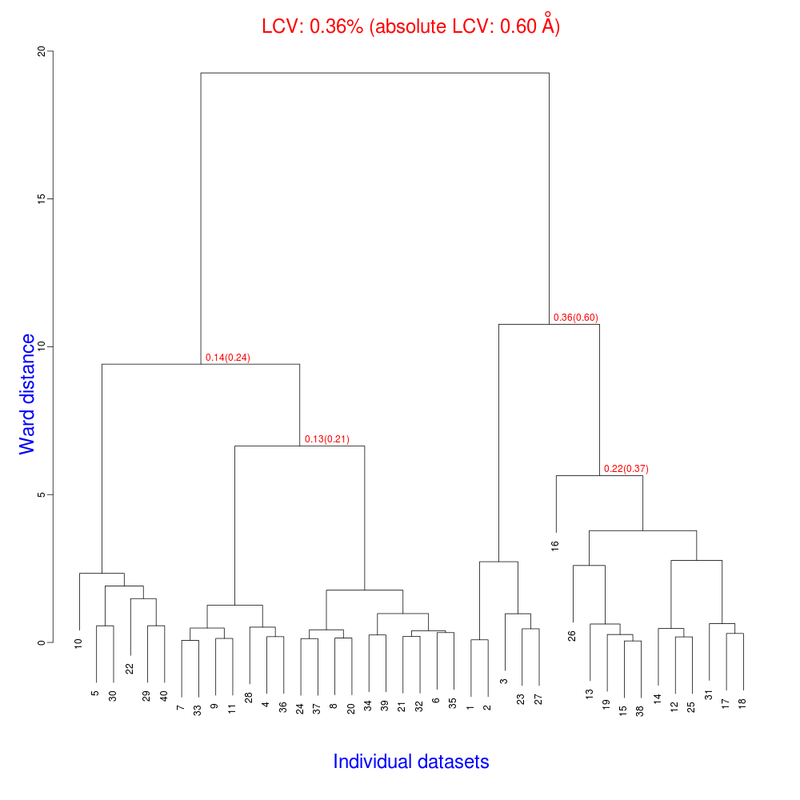 The LCV is now as low as 0.36% (aLCV 0.6 Angstroms). This indicates an even higher degree of isomorphism than detected during after individual processing. So although joint refinement leads to slightly higher RMSDs for each experiment (as we expected) the resulting unit cells are more similar. It is worth remembering that no restraints were applied between unit cells in refinement. Given that we know that the detector and beam did not move between the data collections we might like to think that the joint refinement analysis is a more accurate depiction of reality, and thus the unit cells are closer to the truth. Go back and fix datasets that didn’t index properly. We could edit our processing script to attempt method=fft1d for example if the 3D FFT indexing was unsuccessful. Integrate data properly for BLEND’s synthesis mode. We should remove the resolution limits and allow dials.integrate to do profile fitting as well as summation integration.